In Australia I’m told that Kayell are selling of ex demo 5Ds, although this might just be stock rotation, since even with an uncharacteristicly early 5D2 announcement, I wouldn’t expect to see stock for a while. 27th The 5D is still listed on the Canon UK site, but the 350D has been expunged. 25th In an update, I’ve just heard from someone [thanks] who placed an order for the book below, and received an acknowledgement from Amazon. …but not published until November. The sort of thing that would point to a Photokina announcement in time for November supply of the camera. Digital Field Guides are bestselling, beautiful books that deliver information to the consumer in an easy-to-understand way. The Canon EOS 5D Mark II Digital Field Guide will feature over 300 beautiful pictures by acclaimed photographer Charlotte Lowrie. This portable guide will be perfect for professional photographers to take with them anywhere to reference at any time. It’ll help readers better understand this complicated camera and show them how to get the exact shot they want every time. Those of you with longer rumour memories may remember the countdown clock on the Canon CZ site and the announcement in Hebrew on the Canon Israel site. 22nd How about an announcement at “The Southern Hemisphere’s largest photographic show” PMA Australia? May 14th Thanks for all the 1000D screenshots from the DPP 3.4 Windows help files. Adds the luminance noise reduction function for TIFF/JPEG images You can make this setting with the [Tool Palette] tab in [Preferences] and the [NR/LENS] tab from the tool palette. Adds a lens with the aberration correction function and supports the extender. Now supports sixteen more lenses. Newly supports the extender (EF1.4 X II and EF2 X II) to increase the variety in combinations. For supported cameras and lenses, please see the Help file (or the instruction manual). Fixes malfunctions Fixes a bug where RAW images shot with EOS Kiss X2/EOS DIGITAL REBEL XSi/EOS DIGITAL 450D are not displayed in accordance to the PictureStyle file settings. 11th The US rebate scheme will run from May 18th to July 19th. 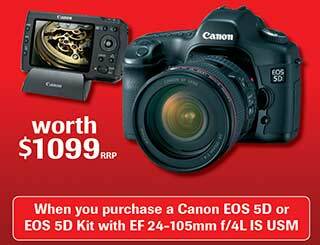 May 8th Good deals on the 5D/24-105 kit in Australia? I was sent the following (thanks). 7th No firm rebate info for the US yet, but a post on FM suggests that the ‘instant rebates’ will include at least the following. At FM there’s a post flagging June for the next Canon announcements. As well as the usual 5D2 there is a 1D3N and two lenses. 28th Being a publicly quoted company, Canon has things like ‘earnings calls’. Read the full report at SA, but see discussion at DPR, including the interesting snippet. A cheap FF camera from Nikon would certainly put the pressure on Canon to bring in a ‘basic’ FF offering … 3D/5D/7D by next year anyone? “Canon USA is in the process of informing U.S. dealers about upcoming price increases on a broad range of its camera gear. Starting May 1, 2008, dealers will pay 3-5% more to Canon for most Canon EF lenses and all Canon EOS and PowerShot accessories (plus all Canon binoculars too). 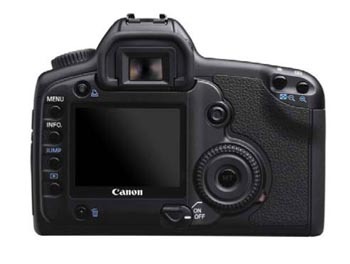 The dealer net on Canon digital SLRs is unchanged. 25th While it’s a bit quiet I’d like to thank all the people who regularly write in with suggestions and links on discussion boards that I’d just never have found otherwise. We try and respond to every mail, but due to heavy spam, we have quite aggressive filtering on our mail servers – if you didn’t get a reply, please try again with different text in the email since our system might have accidentally chomped your message. April 24th Wondering what’ll be at Photokina? Well, there have been some press briefings about what’ll be there. Canon are a sponsor of the football, so might they want something to go with that, but I’d expect the combination of photokina and the Olympics to bring out the big announcements. The opening of the Olympics 8/8/08 is a particularly auspicious date in China. 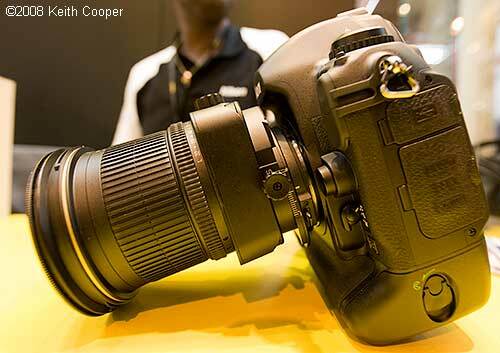 There’s plenty of Nikon rumours going round too (TH) with a D90/D3x/lenses mentioned for late May/early June. “The 5D MK II will be announced in August and not in April. No new series planned in 2008. The interviewee is is the head of EOS product development, he arrived his position last year and conducted a interview with the same site. The appearance of Contrast based AF on the 450D signifies a desire to move away from the traditional view of what goes in a DSLR – it’s still not good enough for ‘active scenes’ They are keen to preserve the ‘essence’ of the SLR camera. With the development of LV, Canon may put the popular Intelllegence Auto mode in SLR as well, recall that Programme AE was brought into SLR by Canon. They are actively doing research in how to further improve CMOS’s noise level, some results were shown on 450D, as they promote new SLR, they improve the CMOS’s quality. The interviewee wants to make the FF market parallel to APS-C personally, however this was not quite practical at the moment. He said APS-C line has good price/performance ratio, those who go for FF are true enthusiasts. In the future, he wants to add some products at an affordable price for those enthusiasts. Though he thought it is the right time to discuss on the new product arrangement, new product lines will not appear in 2008. For the highly anticipated 5D sucessor, they understand public’s expect, and he asked everyone to wait and see. He claimed that they will do their best to bring out a good product .There will be great improvement in both quality and add-on value. The interviewer covered Canon’s old tradition of “limiting users at diiferent levels” and is excellent yet not stunning. The interviewee agreed and said in the past they often considered that “Dealing with cost limit and specification” is higher than “anticipation of the designer”, however, this is changing. All in all, besides expecting 5D sucessor at photokina, there is still something else. He said the year has just begun and there are some good things to come. If you’ve got a Nikon D3, best leave off updating the firmware to V1.1 – there are numerous reports [RG] of image corruption. At DCW there is an interview (in Japanese) that drops a few hints about what Canon is planning. More 35mm FF cameras on the way? I’ve also had several people mention (thanks) that the UK Canon eBay ‘outlet shop‘ is empty. Whether this signals anything, or is in any way connected to ‘rumours of shil bidding’ I’ve heard mentioned, is entirely unknown. Whilst some people ascribe this info to a ‘marketing trick’, it’s not unknown for software developers to leave all kinds of stuff inside released software – particularly since any ‘D3X’ firmware would share a significant portion of code with the D3. “When will the last PowerShot cameras that are supported by the SDK be released? This might be connected with Canon moving to putting their own CMOS sensors into non SLR cameras. 4th A CNET article has some info on camera shipments for last year, where Canon just held the No.1 spot in DSLR shipments over Nikon. Notice that in all camera sales, it’s Sony at No.2 showing why some at Canon view them as a bigger long term threat than Nikon. With the 40D now obtainable in the UK for £500, it does make me wonder if Canon will feel there is room for a cheaper full frame variant of whatever replaces the 5D? 2008 March 30th How much will the next FF camera from Canon cost? There is an interesting discussion about camera pricing, from someone with real industry experience, at TOP. 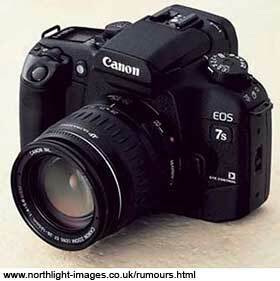 27th We’ve been sent some info regarding two Canon cameras in September. Just when we thought the 1.3 crop was dead… ;-) While I wouldn’t be surprised to see Canon announce two FF cameras this year, I really just don’t see them making any use of a 1.3 crop sensor. We’ve no independant verification, so do remember that this is a rumours page! If you are looking to get a 5D in Australia, then note this deal for getting a free M80. It runs until the end of May. 23rd While we are waiting for the next Canon FF cameras and that Sony FF camera, there are somehints that the Nikon version is not so far away (D3X?) and won’t be using the Sony sensor. March 20th The new Sony FF camera gets an outing at PIE in Japan. 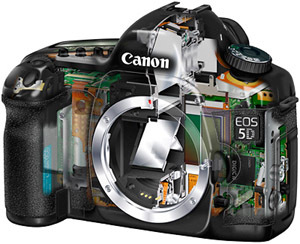 19th Canon have released a firmware update for the 5D (Version 1.1.1). 1 5D now supports high-capacity CF cards. Previously, when using an 8GB CF card or greater (e.g.,12GB, 16GB), even after initializing the card in the camera, the CF card capacity could not correctly be detected. This phenomenon has been fixed so that the camera will correctly recognize high-capacity CF cards. 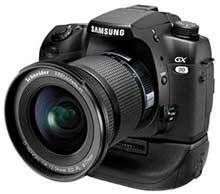 2 5D allows the latest lens names to be recorded in the Exif information of images taken. The lens IDs of lenses released after EOS5D are not in the camera; so these lens names could not be recorded in the Exif information of images. The lens IDs for the follwing new lenses are now included, so that the correct lens names will be recorded in the Exif information of images. 3 Lenses that are compatible with the Digital Photo Professional 3.2 lens aberration correction function have been added. More lenses will be supported by the lens aberration correction function of Digital Photo Professional 3.2, Canon’s RAW image viewer/editing software. Specifically, the four lenses listed in item 2 above have been added. In images taken with these lenses and cameras updated to v1.1.1, the lens aberration correction function can be used. For other supported lenses, see the user manual for DPP 3.2. Adobe have also released new versions of Camera Raw and Lightroom and DNG Converter to support newer cameras. Previous camera profiles identified in the Calibrate panel may have displayed poor results at extreme ends of the temperature and tint ranges. A new camera profile identified as Camera Raw 4.4 is now available and will be applied by default to all images currently without existing Camera Raw or Lightroom settings. The creation of new default settings will also include the updated Camera Raw 4.4 profile. Images edited in Camera Raw or Lightroom with earlier profiles will retain the earlier profile value and visual appearance. I often see ECF mentioned in people’s wishlists for future cameras (see 7th Feb for more on Eye Control). Well after Chuck Westfall mentioning it as a marketing led omission last month, he’s added this in his latest (and usually quite informative) tech tips. There’s also a leak [dSLRu] of the Olympus E520, that appeared for a while on the Olympus web site. Dual Digic III with all-new “CXR” NR system reported to best 3rd party NR software. Available as a C.F with 4 levels of customizable parameters. It seems too that rebates are starting in Canada on the 15th? I’ve not got details yet but saw a comment on a board, that they were doubled with two items on the list? 3rd I’ve updated the AF check article with a few more example shots after a few people asked for some more details on just how you use the patterns to check AF accuracy. Now the European rebate scheme has started, I’ve got the UK rebate amounts. Earlier in the same thread there are also some reasonable musings on likely 5D2 (or whatever) characteristics. One feature I’d expect the 5D2 to have is AF microadjustment. I was sent an interesting test image to make the process of setting of this a lot easier. Earlier today I did a quick check to see which of my lenses needed an adjustment setting, and which didn’t. I’ve put all the info in a short article on AF Microadjustment. There was indeed long queue at the Jacobs stand, so it looks as if quite a few people thought there were bargins to be had. 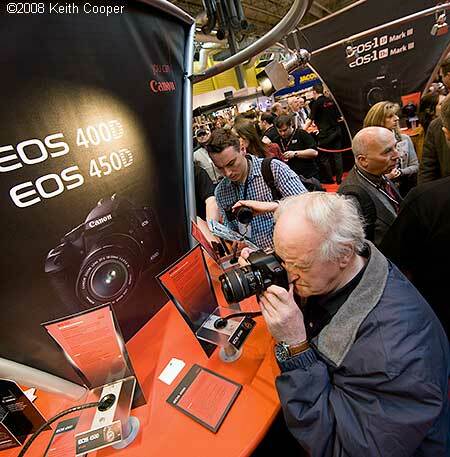 This year also marked the return of Canon, with a large stand displaying many of their wares. I took the opportunity to check out large printers from Epson, Canon and HP. During this year, I’m hoping to have a more detailed look at just what some of the newer printers are capable of, along with different ways of getting the best out of them. As well as invites to various press briefings (under NDA, so for once I can’t spread any rumours ;-) I was looking for products to add to the Northlight Images reviews. I had a quick look at the D3 and the new 24mm T/S lens on the Nikon stand. The lens feels noticeably lighter than the Canon one, but obviously just from looking through the viewfinder, there’s not much other difference you can see. The £150 seems to be the Canon UK rebate that’s starting on March the 1st. More info on the Canon rebates should appear on this Canon site. 21st Apart from noticing more UK prices creeping up, ready for the rebates, the rumour mill seems to have taken a bit of a rest after all the activity around PMA. February 16th Already I’ve heard of some slight price rises for the 5D in the UK. 14th No sign of 5D prices moving back upwards, with most on offer in the UK at just under £1200 for the body although the price with the 24-105 has gone up with the end of the rebate scheme. I’ve found the guide to UK prices at CPB is a good indicator for pricing trends. Canon’s usual strategy is two announcements a year (or more accurately in Jan/Feb or Aug/Sept) so most discussions [POTN example ;-)] look to Photokina. In a follow up to the ECF info below, it would seem that Canon is not yet done with taking pictures of your eyes. A recent patent (Pub. No. : US 2008/0025574 A1) of theirs takes a picture of your iris for subsequent embedding of biometric info into pictures. 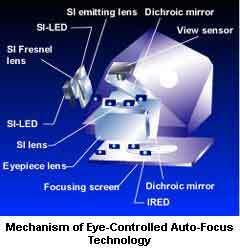 The camera includes a sensor for sensing the photographer’s iris image and registering the image in advance. The iris image is recorded in the image of a subject by a digital MCU at a timing different from that at which the image of the subject is captured. The recording timing is that at which the camera power supply is turned off, that at which a recording medium is ejected from the camera or that at which the iris image to be recorded is changed to changed to the registered iris image of another photographer. The recording of the iris image is achieved by embedding it as a watermark or by appending it to metadata.” More info at PB. Whilst looking at our old rumours connected with the 3D I found this, which was one of the other sources for the “everything but introductory cameras with FF” theme. As ever it’s always following back the links if given. He notes that even after 2.5 years, there is still no FF competitor for the 5D -at the price-. Note the mention of lens releases and how the 1D series at 1.3x crop was aimed at 1.5x and 1.6x competitors. More than anything the arrival of the D3 suggests that the next high speed camera will be FF. 2008 February 1st Without a 5D2 at PMA, the general expectation has moved to ‘nothing until August’ (GM for example). At PMA, Sony talk more about their forthcoming 24.6MP DSLR (CMOS with Super Steady Shot stabilization). 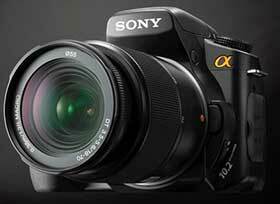 The Sigma DP-1 was mentioned again, it has a 4.7MP Foveon Sensor witha 28mm (equiv) lens [DPR]. Pentax also getting announcements out about potential new cameras [DPR] Firmly still in the vapourware category though ;-) If you read through the thread, you’ll see a lot of discussion about potentially dropping the current mechanical AF system for lenses. Seeing all this and similar discussions in Nikon forums about new ‘electronic’ lenses made me reflect on Canon’s move to EF lenses, which led to a lot of people with unusable lenses at the time. As someone whose first Canon camera was my 1Ds, I missed this change, so just get the benefits of an all electronic range of lenses. Tokyo, Japan – Sony Corporation today announced the development of a 35mm full size (diagonal: 43.3mm/Type 2.7) 24.81 effective megapixel, ultra-high speed high image quality CMOS image sensor designed to meet the increasing requirement for rapid image capture and advanced picture quality within digital SLR cameras. Furthermore, because current semiconductor exposure systems are unable to cover the entire chip surface of 35mm full size CMOS image sensors, multiple exposures are required. This results in the difficulty of accurately controlling exposure variance and matching circuit patterns. 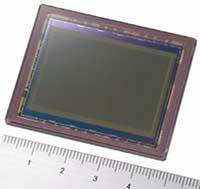 The newly developed CMOS image sensor combines unique circuit design technology with Sony’s advanced fabrication expertise, including a system of joining multiple exposed patterns together and advanced planarization for minimizing fluctuation, to realize 35mm, full size, 24.81 effective megapixel resolution. Sony’s “Column-Parallel A/D Conversion Technique” also provides each column within the sensor with its own A/D converter, minimizing image degradation caused by the noise that arises during analog processing while at the same time delivering an extremely high signal conversion speed. Nikon have announced several new lenses, the one that interests me the most is the 24mm tilt/shift. I’ve got a page with all the NIKKOR 24mm f/3.5D ED PC info and have included some examples from one of my articles for people new to tilt/shift lenses (or Perspective Control in Nikon parlance). 28th Still nothing new :-) However, do have a look at what Thom Hogan has in store for Nikon this year. Quite a few things, that if they came about would put some fair pressure on some of Canon’s offerings. There is a purported Nikon press release for the D60 on DPR. 10.2MP, Anti-dust, “Nikon’s exclusive Airflow Control System” A D40X with anti dust and a few other features? Since PMA is next week (Jan 31st to Feb 2nd) we won’t have long to wait. More megapixels? Scaling up the 450D sensor comes out at ~32MP. The table below is from the other PDF (Current DSLR lineup). The table was ripped from the actual PDF and tidied a bit. 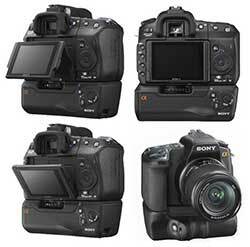 “What is confirmed are two new entry-level EOS DSLRs and both won’t be a 5D replacement or successor. Whether any of these two models are going to be 1.6x, 1.3x or FF is anyone’s guess for time being. There’s a DPR post with some thoughts on the two upcoming FF cameras. 21st The popular ‘Tsiphoto’ makes a usual late entry on DPR and announces that “pma will not bring a new 5d body….. ” This poster, who has a ‘better than most’* record with pre-launch info is usually regarded a a harbinger of product announcements on DPR. 18th In an update to what we were told the other day, it seems that Canon is using bespoke CF cards of around 50GB for the testing of the new cameras. As ever remember that this is a rumour page! My own thoughts are that some of this fits in with the some 1Dmk4 info we had (ie no MK4 and a new ‘1’ series designation) The 25FPS could refer either to HD video output or the new CMOS designs from Canon that have been addressing the ‘electronic shutter’ issue. 25FPS is an awful lot of data to process at higher resolutions…. Some sighting in Amazon listings suggest the 450D a possible entry at PMA. 7th In an announcement for the 2008 CES in Las Vegas (all this week), Sony have posted details of the follow up to the A100, the 10.2 MP A200. One feature of note is their return to CCD technology for the APS-C sensor. All the specs at DPR. 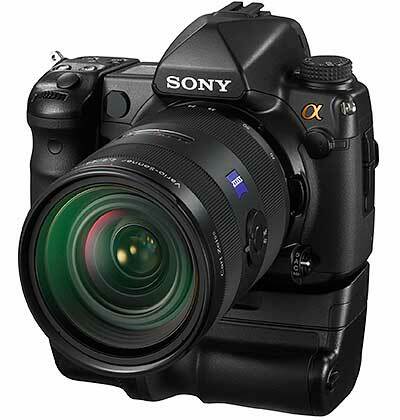 Good to see someone reckons the Sony Alpha 900 will be 21.42 MP ;-) [‘picture‘] Other guestimates suggest ~14MP FF. Meanwhile there is the expected A200 some time in the next few weeks (12MP?). A delay in the 5D2 -might- be more likely signify a split into higher and lower end FF models (3D/7D) since what was going to be in the 5D2 has been around for a while (see below). If you missed the row, then it seems that in France, Canon got very miffed with a well known French magazine for its coverage of the 1D3 AF issues, and pulled all its advertising – more details on the 1D3 page. Sony are updating some of their DSLR support services in January, possibly in time for for a PMA launch (although don’t forget 2008 is also a photokina year). The emphasis in a lot of Sony info I read is still towards the consumer or ‘enthusiast’ markets, although don’t forget that in Japan, the 5D was reputedly not seen as a ‘pro’ offering. If Sony were serious about moving into the ‘Pro’ DSLR market (and I mean the cameras being used for serious professional use) then they need to provide support services at all the large events, where you’ll traditionally see dedicated on site service centres and provision of emergency ‘loan’ kit to cover accidents. They do already have this to some extent in their video market support. It’s appearance in the stills camera market would be a serious announcement of intent, and one likely to make Canon and Nikon raise their threat appraisals of Sony. so although what we’ve been sent looks pretty good, use your own judgement!